The 7-year fixed rate has traditionally been the ugly stepchild of the mortgage world. It rarely offers enough extra interest rate protection to justify its higher cost (compared to a 5-year term). Nonetheless, a few people do choose 7-year terms because they require more rate certainty than a 5-year fixed, but don’t want to pay the higher 10-year rate. Fixed rates can have higher penalties for early termination. Major bank penalties, in particular, can be relatively extreme as they are calculated using the bank’s posted rates instead of its actual rates. 7-year mortgages have historically cost borrowers much more interest than variable and shorter-term fixed rates. Most people under 50 years of age won’t keep their home for seven+ years, raising the odds they’ll renegotiate before maturity. That, in turn, raises the chances they’ll pay a penalty with a 7-year fixed. Only about 1% of borrowers (or less) choose 7-year fixed terms. The maximum penalty by law is three months’ interest if you break a fixed mortgage after 60 months. 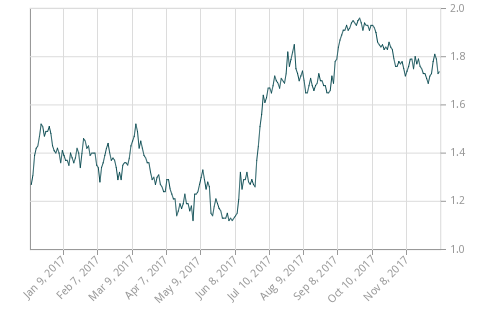 If you want to guesstimate where 7-year rates are headed short term, keep an eye on Canada’s 7-year government bond yield (below).